EnviroDEFENSE® Starch Degrader is an industrial strength concentrate of enzymes and natural microorganisms specifically blended for liquefying and consuming highly concentrated starch compounds. The naturally occurring bacteria formulated in EnviroDEFENSE® Starch Degrader works by digesting organic waste materials to prevent malodorous situations and sludge build-up. 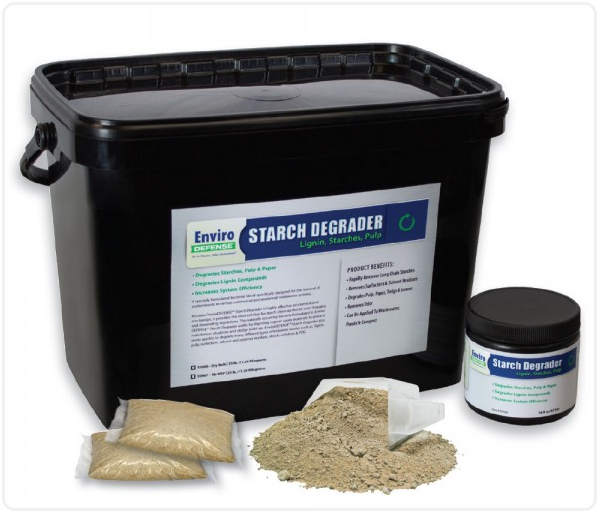 EnviroDEFENSE® Starch Degrader has also demonstrated great success in the degradation of many types of industrial wastes including; lignin, pulp, surfactant, solvent and polymer residues, starch, cellulose & FOG. *Rates Based On Every 500,000 Gallons Of Flow Per Day. Use start up application for first 30 days then use routine application.